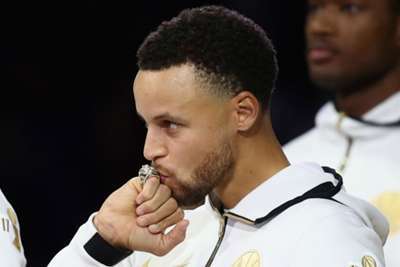 Golden State Warriors superstar Stephen Curry received his third NBA championship ring on Tuesday and never expects to tire of such ceremonies. The Warriors celebrated their 2017-18 title win ahead of tip-off in their season opener against the Oklahoma City Thunder, with a new banner unfurled in the rafters at Oracle Arena. Two-time MVP Curry revelled in the occasion and urged for specific measures should he ever become apathetic about such events. "[It was] kind of an emotional night for a lot of different reasons. Obviously you want to celebrate the championship and get the rings and watch the banner drop, then you've got to turn the page quickly," said Curry after scoring 32 points in a 108-100 victory for the Warriors. "It's special. I remember looking up there and there was only Philadelphia Warriors banners and the 74-75 teams, so to come into Oracle every night – even in our practice facility – look up on the wall and the rafters and see three championship banners that we brought back to the Bay, it's amazing. "I don't think I'll ever be at a point where it's kind of a 'blah' moment when you're receiving a ring and seeing a banner come down and seeing all those trophies. "If that ever happens I hope someone just slaps me in the face and smacks some sense into me because this is a special opportunity we have." "I mean it's the first game. Honestly, we didn't go crazy-hard running sprints and doing suicides in training camp because we've been here before, we know how to continue to build up and pace ourselves so we don't burn out in January or February," he said. "That's just kind of part of the beast of playing as many games as we have over the last four years and looking to try to repeat that this year. "Guys are accountable for themselves and we all know what we need to do to continue to get better and I obviously expect that to happen." Kevin Durant, Finals MVP for the last two seasons, said the hard-fought, gritty victory over the Thunder was likely to be a sign of things to come from Golden State. "Coming into the game we were excited about kind of finishing off last season with the ring ceremony, but every game is not gonna be a 140-99 shoot-out for us," said Durant. "We are a team that can play though, play physical … there's going to be more games like that this season, especially with teams starting to catch up a little bit with what we do and our schemes. "You're gonna have to appreciate those type of games from us because it's going to happen more times than not."